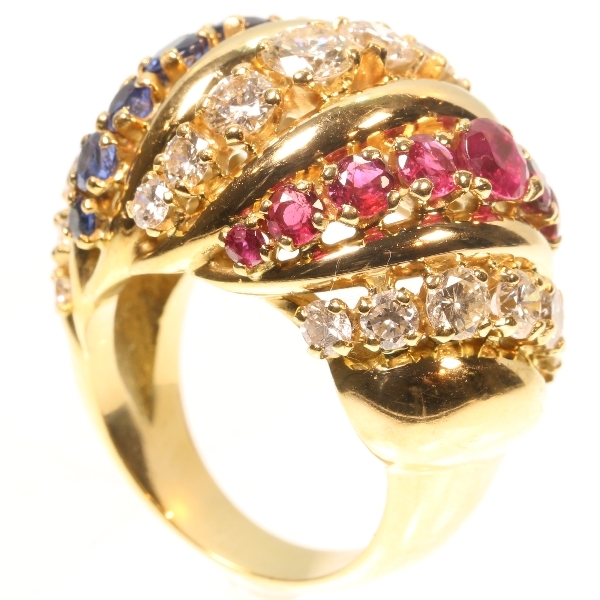 Impressive Fifties Cocktail ring with three diamond rows alternating with rubies: Description by Adin Antique Jewelry. Diamond(s): 22 brilliant cut diamonds with an estimated weight of ± 3.04ct. (colour and clarity: F/G, vs/si). Total diamond weight: approx. 3.04 crt. Precious stones: Eight sapphires with an estimated weight of ± 1.50ct. Eight rubies with an estimated weight of ± 1.50ct. Birthstones: Diamond is the birthstone (or month stone) for April, ruby for July and sapphire for September.